Just a half a mile or so from the shore of Grand Lake lies Adams Falls. 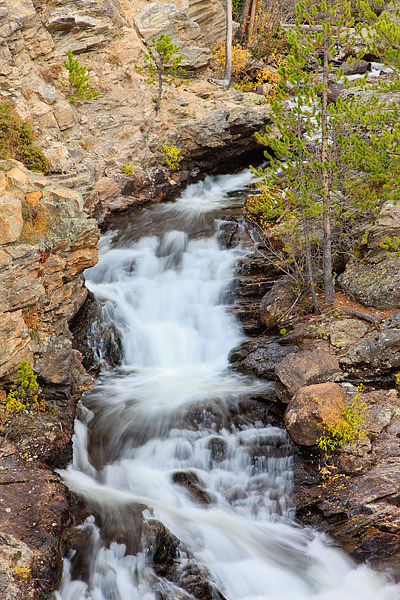 Located on the west side of Rocky Mountain National Park, Adams Falls is an easily accesible, yet impressive waterfall. Located along the East Inlet trailhead, Adams Falls forms an impressive water feature after Echo Creek and the East Inlet Creek combine above the falls forcing water through the narrow chasm that is Adams Falls. The scrub along the falls in the photo is showing it's fall colors and the more subdued water flow of autumn make for a placid sight. Photo © copyright by Thomas Mangan.